Missing his second court date in two days, former dictator Gen Pervez Musharraf has termed the accusations against him as ‘politically motivated‘. In a certain way, they are – and should be – politically motivated: A demonstration that politically ambitious officers cannot undermine democratic rule, abrogate the constitution, and usurp power. Gen Musharraf is accused of doing each of these, and with the preponderance of evidence behind these accusations, a trial is certainly warranted. In another way, Musharraf’s insinuation is correct – Of everyone who was involved in these crimes, why is he being singled out for trial? The question we should be asking is not whether or not it is fair to try Musharraf. There can be no doubt that the answer to that question is yes. The question we should be asking is why there aren’t more people being tried with him. Let us put to rest one common myth about the politacisation of Musharraf’s trial. It is not due to vendetta by Nawaz Sharif for Musharraf’s overthrowing his government in 1999. It can’t be for the simple reason that Musharraf’s trial completely ignores the 1999 coup. Musharraf is accused of treason not for overthrowing the democratically elected government, but for sacking his own hand-picked judiciary eight years later in 2007. While this in itself should raise eyebrows, it is even more disturbing once you remember that 2007 was the second time Gen Musharraf sacked the judiciary. He had originally sacked the judiciary in 2000 after the justices refused to take an oath to him under PCO. The Supreme Court was then replaced with new justices who swore oath to the dictator and gave his orders a rubber stamp. Why are none of these justices, the men who betrayed the very constitution they were sworn to uphold, being ignored? Gen Musharraf did not overthrow a democratic government and rule for eight years through his own sheer will, but the aid and involvement of other powerful people who are now going scott free. Why, for example, are the following two men not being called to answer for their actions? Lieutenant General Mahmud Ahmed: Corps Commander of X Corps, Rawalpindi who aided the overthrow of the democratically-elected government and was awarded the post of DG ISI for his effort. 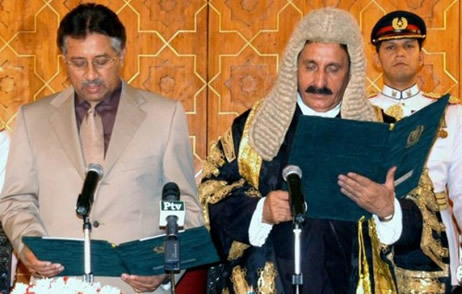 Chief Justice Iftikhar Chaudhry: Prior to Musharraf’s coup, Iftikhar Chaudhry was a young, ambitious judge in Balochistan. He was elevated to the Supreme Court by Gen Musharraf in 2000 after agreeing to give judicial cover to Musharraf’s illegal activities. When Shan Khurso was allowed to walk scott free after committing a murder, the nation was repulsed by what appeared to many as a case of selective justice: One law for the common man, another law for the rich and powerful. Musharraf should not be allowed to snub the court and avoid justice, but neither should those who abetted his crimes – no matter how powerful they may be. This entry was posted in Blogs and tagged 1999, coup, Iftikhar Chaudhry, justice, Lieutenant General Mahmud Ahmed, musharraf, PCO by Sidra Jafri. Bookmark the permalink. Frankly it is a selective trial. This government needs a scapegoat to play with the psyche of the masses, helping it cover her own defects. The third term elected Prime Minister should have the moral courage to begin the trial from October 1999 and also condemn the Martial Law of July 5, 1977.